The latest product in a line of continuous product innovations, the Free Chlorine Water Check offers the user an extremely comprehensive testing system. Currently under US EPA evaluation, the test offers a range of 0.05 to 10 PPM (mg/L) with no monochloramine interference. With accurate and reproducible results in under 1 minute, the Free Chlorine Water Check (Models: WTS-481026 and WTS-481126) is sure to revolutionize Free Chlorine testing as you know it. These water quality tests are the sensitive and safe alternative to wet chemical free chlorine tests. A mechanical reader is not required, even for the 0.05 PPM or mg/L sensitivity. The unique indicator is reactive only to free Chlorine; therefore, no interference to monochloramines occurs. Accurate results are achieved in under 1 minute. Products are available with ranges from 0.05 to 750 PPM (mg/L). 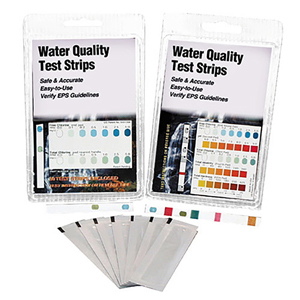 Most test strip products are available in two different packages; individual packets with a detailed color chart card or in bottles labeled with a color chart. No mater which option you choose, all products offer the same high level of quality and reliability. Most products are available in bottles of 50 strips or 30 individual foil packets with a detailed color chart card. Total Chlorine test strips offer both versatility and sensitivity without compromising accuracy. Ranging from 0.05 to 80 PPM (mg/L), Total Chlorine strips use patented technology to make your testing easier. With results being achieved in under 1 minute, Total Chlorine test strips save you time and money. Testing multiple parameters in water takes time and money. With these combination test strips you can reduce testing time and expenses. Testing for free and total chlorine on the same strip, the WTS-480655, offers accuracy and reliability. If more parameters are required, the 4-in-1 water check tests for total chlorine, pH, total hardness and total alkalinity. The 5-in-1 strips test for pH, total alkalinity, total hardness, free chlorine and total chlorine, all on one strip! With the usage of alternative oxidizers becoming more predominate, you need a quick, reliable and economical test. Offering sensitivities from 0.05 to 30,000 PPM (mg/L), Peroxide Check answers demanding testing needs. Iodine has been used for many years as a sanitizing agent. Measurement concerns have necessitated the need for an accurate, economical way to check Iodine levels. Iodine Check offers the user a wide range of sensitivity, 0.02 to 300 PPM (mg.L), while still remaining accurate and affordable. Manufactured under exacting conditions, all of these products provide accurate results ideal for the food, medical, industrial, and potable water industries. pH is a natural part of water chemistry. pH Check test strips are designed to offer results with minimal cost. For a more comprehensive test try the combination pH/total Alkalinity test strips. Whether you are testing for Iron or Copper on surfaces or in water, OMEGA has a solution for you. Iron and Copper tests make short work of an otherwise frustrating project. Requiring no mechanical reader or extra reagents, Iron test is an extremely accurate and sensitive test for measuring from 0.02 to 5.0 PPM (mg/L) in water. Designed to complement the Iron test product, Copper test strips report results from 0.5 to 10.0 PPM (mg/L) without the need for a mechanical reader or hazardous reagents to mix. Calcium is found in water naturally from leaching. A typical sign of high calcium is scale that can build up in your bathtub. Accurate calcium measurement is very important to prolong the life of appliances and plumbing. The Total Hardness test strip provides accurate and reliable measurement without sacrificing time and money. This product produces accurate results in only one second! Nitrate Nitrogen and Nitrite Nitrogen can be very harmful in water. Side effects range from a lack of energy all the way to severe illness and, sometimes, death. Quickly and accurately determining the presence and levels of Nitrates and Nitrites in your water can save more than time and money. Nitrate/Nitrite Nitrogen test strips offer the user more than accurate, cost-effective results. The precise measuring tools offer the user peace-of-mind and safety. Ideal for the potable water industry, food industry, medical industry and educational classes. Nitrate/Nitrite Nitrogen test strips offer a sensitivity of 0 to 50 PPM (mg/L) for Nitrates, and 0.15 to 10 PPM (mg/L) for Nitrite Nitrogen. With a large, easy to read color chart and an economical price, Nitrate/Nitrite Nitrogen test strips are a must for any scientific tool kit.